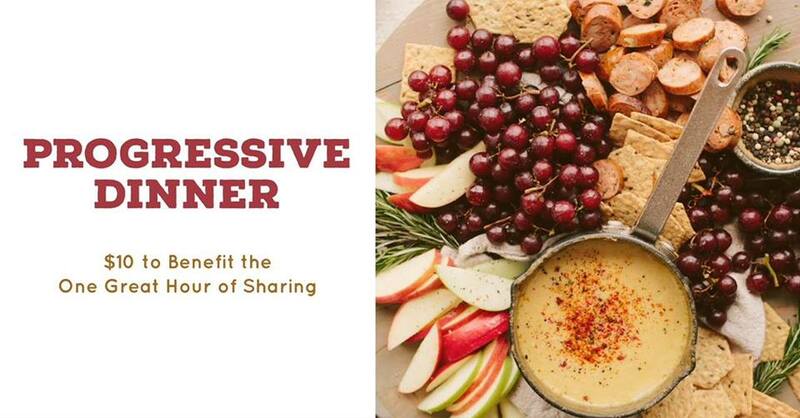 Please join us for our annual Progressive Dinner! Take part in a fun and delicious evening, switching host homes for each course. The cost is $10 per person and is not due until the dinner. All proceeds benefit the One Great Hour of Sharing, which enables the church to provide relief to those affected by natural disasters, provide food to the hungry, and help to empower the poor and oppressed. A sign-up sheet is now available in Legacy Hall during coffee hour. Sign up to host at your home or to attend. Hosts are asked to provide appetizer, dinner and dessert courses. Attendees are asked to bring either an appetizer, salad or dessert.